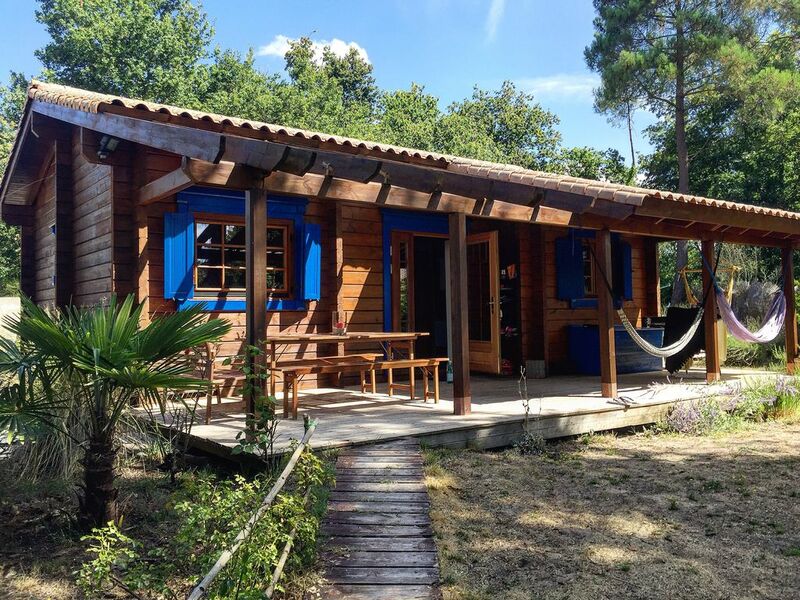 The proposed rental is actually a solid wood chalet, independent and with all the comforts: Interior space of 56m2 with 3 rooms: fully equipped kitchen with dining room and lounge with TV TNT. 2 rooms are at your disposal: the first with a large bed (140x200), a wardrobe; the second being refurbished this winter to offer another room with a large bed (140x200) and a dresser (storage is available as well as games). Finally, a massive mezzanine allows a couple of lovers (1 double bed 140x200) to settle quietly! The ensemble is completed by a shower room and separate wc. The hiring is completed by an enclosed garden of 400m2 with 2 terraces and flowers including a sheltered and the other facing south: the terrace of over 25m2 is semi-covered and thus partially shaded. A second south facing terrace allows you to enjoy the sun, it is embellished with a wooden table for lunch quietly! Sunbeds waiting for you to enjoy this mild climate. GOLF: The Golf enthusiasts will enjoy the Royan Golf! it is a near Les Mathes and let you access them without ever suffering plugs linked to other local activities! The return to the Chalet will allow you to quietly enjoy the quiet Mathes ... yet close to restaurants, attractions or even the great sandy beaches where it is good to walk in any season! Palmyre Zoo: One of the most beautiful zoos in France: births are common and the zoo is just beautiful: well-kept, flowered and spacious! The summer does not always enjoy the zoo since many tourists come to discover the different species then the time of a weekend or during a holiday in quiet time will enjoy this beautiful site! Beaches supervised or not? La Cote Sauvage can enjoy the waves of the ocean in a great calm. In contrast, the beaches of Palmyra or Ronce Les Bains are monitored and the waters are calmer there. A little shell fishing? according to the season and permissions ... go walk on the Palmyra or Ronce les Bains hulls and pallourdes can expect ... for oysters, it is best to enjoy the 'good plan' mentioned in our brochures instead! The bathroom is independent toilet. It has a sink and a shower. It may be heated using a heated towel rack in the winter. A washer dryer is also available. The bathroom is decorated in natural wood, leaving space for you to sit with all your personal belongings. Storage space are also available under the sink. A hairdryer is available. The barbecue, indispensable for grilled fish, is left to your discression on the terrace. Wood is available on the side of the house and pine cones (at will in the sector) will ensure a good fire! if you prefer, an electric barbecue is also provided and stored in the kitchen. The chairs allow you to enjoy the pleasant climate of this beautiful region. Children's playground are also offered in the cottage or in the great outdoors safe which can also address surfboards or other pleasures of the sea. Super week-end dans ce magnifique chalet très mignon, idéal pour passer un bon moment en famille ou entre amis. Les commerces et plages sont à moins de 5 min, le marché de la Palmyre et ses longues promenades au bord de la mer. Idéal pour se ressourcer. Un seul point négatif, le séjour passe beaucoup trop vite. Nous recommandons et nous reviendront !!! Merci pour votre retour positif, louer notre chalet a des familles qui apprécient notre location nou sfait réellement plaisir. Il est vrai que la région et notamment le zoo sont fantastiques !! Un chalet fonctionnel, confortable et spacieux, avec toutes les commodités, décoré de telle façon que l'on s'y sent tout de suite chez soi. Il est prolongé sur toute sa longueur par une grande terrasse, à-demi couverte, avec une table et des bancs en bois. (une autre terrasse avec , elle aussi, une table et des bancs en bois a été installée dans le jardin). L'intérieur reste d'une fraîcheur agréable par forte température. Idéal avec un chien et/ou des enfants car il n'est pas situé en bordure de route : un cocon en pleine nature pourtant proche de tout et nullement isolé. Bref, le genre d'endroit dans lequel vous avez le sentiment de laisser un petit morceau de votre cœur en partant. Petit bémol : la qualité de la literie (matelas 140 qui a un peu "vécu") et la douche mais nous venons de voir que celle ci-a été refaite à neuf !! Nous comptons bien y retourner l'été prochain ! Les retours des locataires sont tres importants pour nous : comme vous l'avez vu : une belle douche a l'italienne a pris la place de la cabine de douche ....et nous venons de nous occuper de la literie ... Tout est pret pour une nouvelle saison! Très agréable semaine en famille. Le chalet est chaleureux, calme et le jardin est très appréciable avec les enfants. Il est très bien équipé. Le coin est dépaysant et il y a toutes les activités à proximité pour les enfants. Golf: Royan Golf is nearby and the arrival of the Grande Cote allows you to enjoy seascapes nice touches before enjoying the beautiful spaces of Golf. les tarifs s'entendent toutes charges comprises et nous y intégrons également les taxes de séjour demandées par la commune des Mathes. Le séjour se réalise du samedi au samedi.en pleine saison et peut être établi selon un autre calendrier en inter saison.